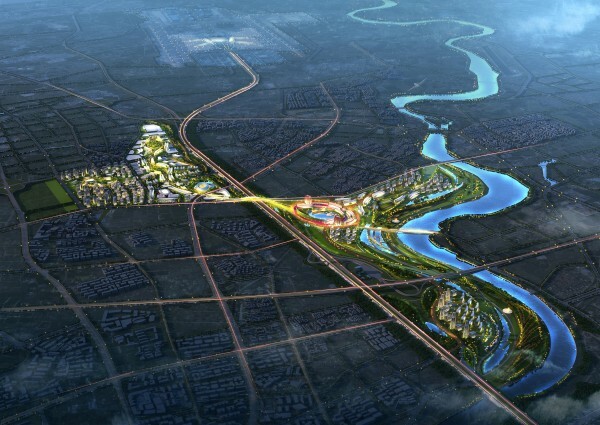 Woods Bagot has won the international competition to design China Southern Airport City, a 988-acre (400-hectare), mixed-use development set on the Liuxi River in Guangzhou, China. 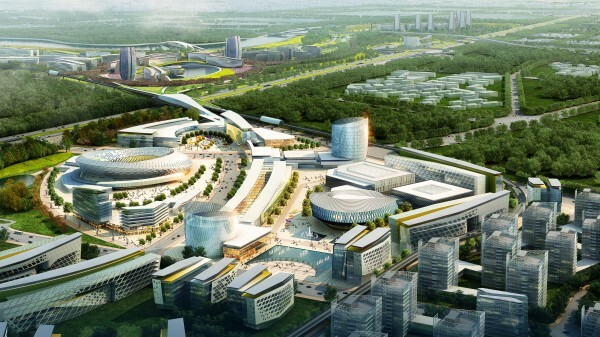 The design, which totals 41 million square feet (3.8 million square meters), expands the traditional corporate headquarters to an urban scale, blending business and manufacturing uses with lifestyle and residential components. This new active district will support China Southern Airlines’ brand and continued leadership as Asia’s largest airline. The design establishes a sweeping physical form that unifies the Airport City site—comprising two wing-shaped parcels bisected by a major highway—and presents a legible identity that is visible from arriving and departing planes. Within this landscape, landmark buildings, parks, lakes and other features define a series of programmatic “neighborhoods” that provide a sense of order and wayfinding at the human scale. The master plan organizes the neighborhoods into three precincts. Business, cultural, and entertainment uses as well as Southern Airlines University define the central precinct, creating a distinct heart that bridges the highway. 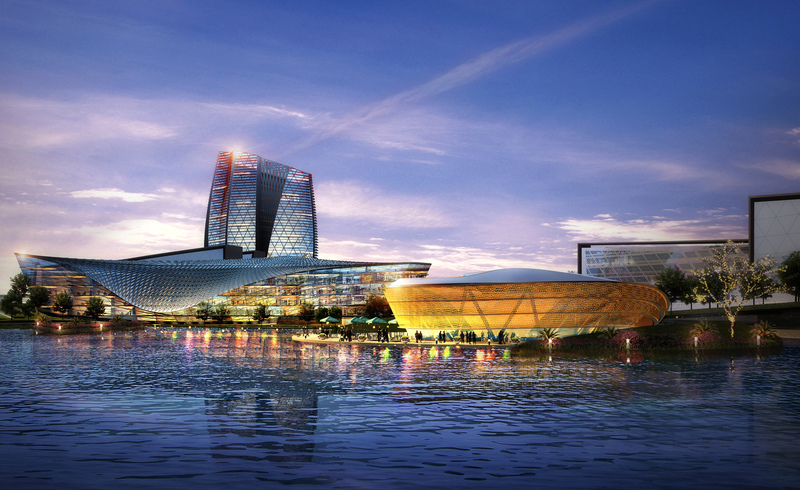 Here, a bend in the Liuxi River naturally highlights the project’s centerpiece: an executive complex including offices, a five-star hotel and VIP club overlooking an expansive lake. Manufacturing, operations and research facilities form a second precinct to the northwest while residential and lifestyle neighborhoods compose the third precinct along the riverfront. The landscape architectural and ecological concept—designed in close collaboration with Hargreaves Associates and Sherwood Design Engineers—overlays bold sculptural landforms with a series of contemporary urban, academic and residential landscapes. Each landscape is rendered with a unique indigenous flowering tree to further distinguish the Airport City neighborhoods and celebrate the rich Chinese garden palette. 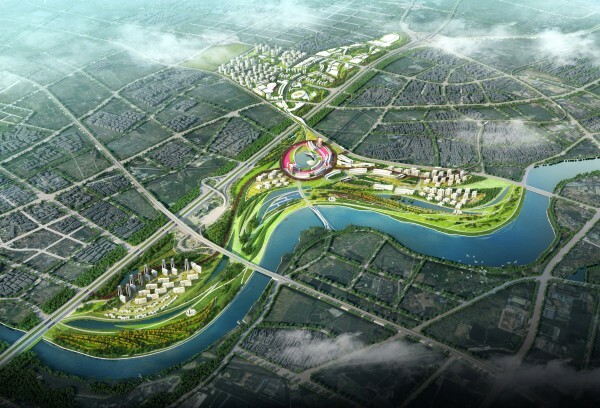 The landforms buffer the freeway and enhance views to the riverfront, while restoration zones, including a new freshwater wetlands and necklace of lakes, serve to cleanse stormwater and repair the site ecology.